The street sign at Patchin Place, where Djuna Barnes lived for 40 years at Number Five. In honor of International Women’s Day, March 8th 2018, we are highlighting the accomplishments of some of the women who you will cross paths with when you are part of our guided walking tours. Djuna Barnes is credited with writing and having published the first lesbian-themed novel, Nightwood in the 1930s. Based on her stormy love affair with Thelma Wood, an American artist, the novel covers their time living in Paris in the 1920s. We visit the apartment house where Miss Barnes lived as part of our Gay Village Walking Tour. 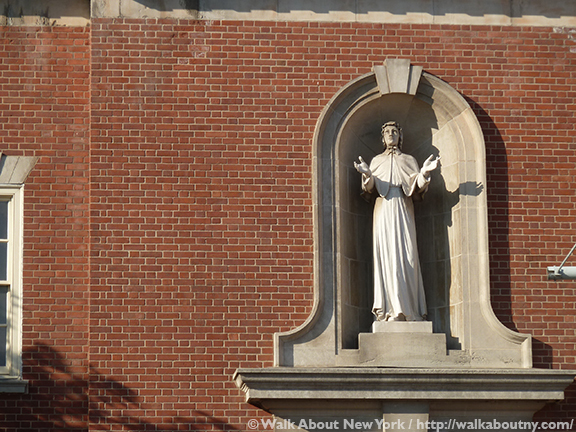 An image of St. Elizabeth Seton is above the door to the Church of Our Lady of the Rosary. Elizabeth Ann Baylor Seton was the first person who was born in what became the United States to be canonized by the Roman Catholic Church. Mother Seton, as she was known after becoming a nun, was a native New Yorker; she was born on Staten Island. Learn about the private house connect to the church where her shine is when you are part of our Downtown Manhattan Walking Tour. The West 10th Street façade of Greenwich Village’s beloved bookshop. 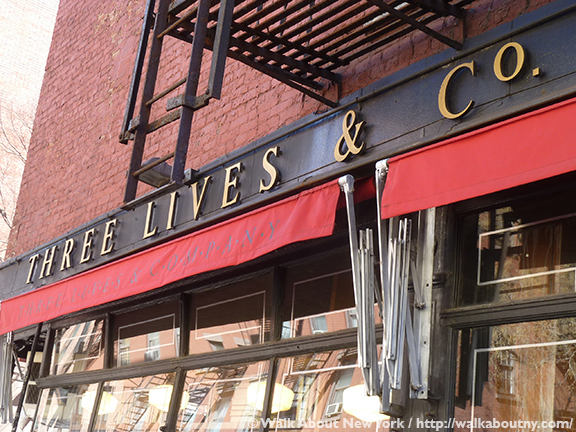 One of the few independent booksellers remaining in New York City, Three Lives & Co. was founded in 1976 by three women friends. They took the title of a collection of short stories by Gertrude Stein, Three Lives, and adapted it for their sweet little bookshop. This thriving business is beloved by its neighbors; discover this wonderful corner of The Village when you take our Greenwich Village Walking Tour. 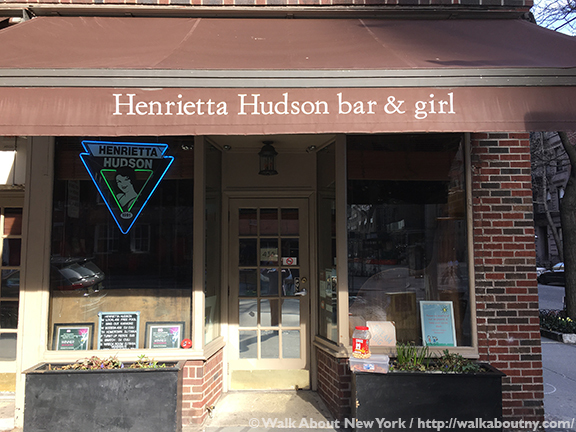 This lesbian bar in the West Village is a thriving hub for the lesbian community. This detail of Xenobia Bailey’s “Funktional Vibrations” dazzles commuters daily. Textile artist Xenobia Bailey has spun her talents to create a monumental work of art—titled Funktional Vibrations—at New York’s Hudson Yards station, the 469th station in New York City’s subway system. 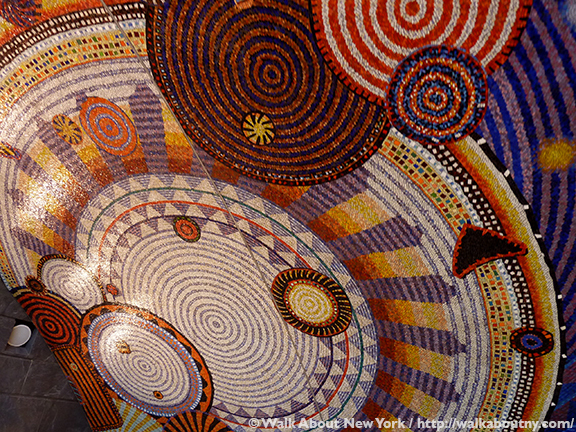 Marvel at how the artist’s circular patterns, simulating vibrations, have been interpreted in multi-colored glass mosaics when you are among our guests for Subway Art Tour Three. “Song” is one of three enameled medallions at Rock Center by Hildreth Meière. The only woman who contributed art to interpret John D. Rockefeller Jr.’s vision of Rockefeller Center, Hildreth Meière was nonetheless a powerhouse in architectural mosaics in the 1930s. Her designs are can be seen from Nebraska to the Big Apple. 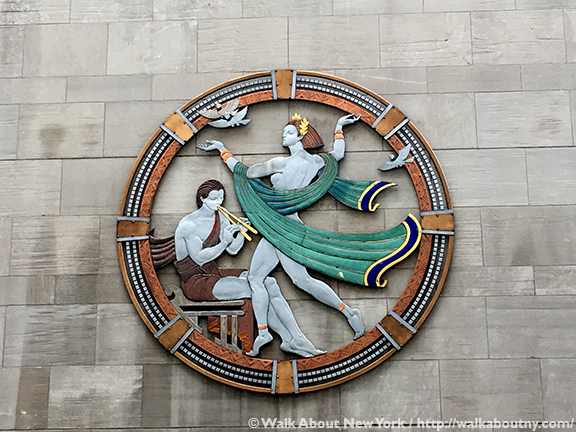 You will delight in her metal medallions—the epitome of Art Deco design—at Radio City Music Hall when you take our Art of Rockefeller Center Walking Tour. 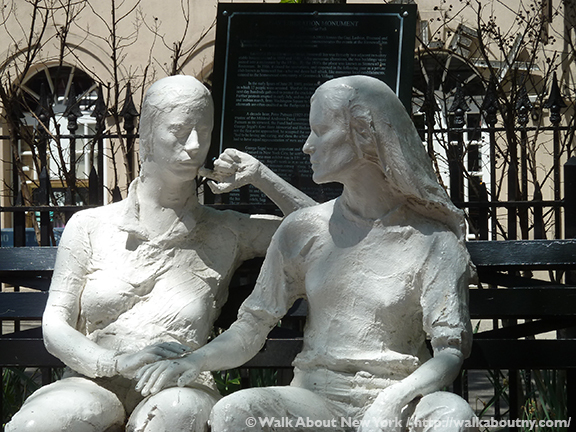 George Segal’s “Gay Liberation” are based on lovers Leslie Cohen and Beth Suskin. Few people get to be immortalized. Leslie Cohen and Beth Suskin will forever be the lesbian half of George Segal’s 1980 Gay Liberation. Ms. Cohen was among four pioneering women when they opened the first lesbian-owned, lesbian-managed bar and lounge. The Sahara, located on Second Avenue at East 65th Street, opened in May 1975. Learn more about Ms. Cohen and the Gay Liberation Monument when you are part of our Gay Village Walking Tour. The historic but modern ceramic mosaic designed by Jean Shin. When the Second Avenue subway line opened in January 2017 it was the realization of a project 90 years in the making. Ms. Shin, a graduate of and professor at Pratt Institute, designed Elevated, a permanent art installation, on three levels and in three mediums at East 63rd Street and Lexington Avenue. 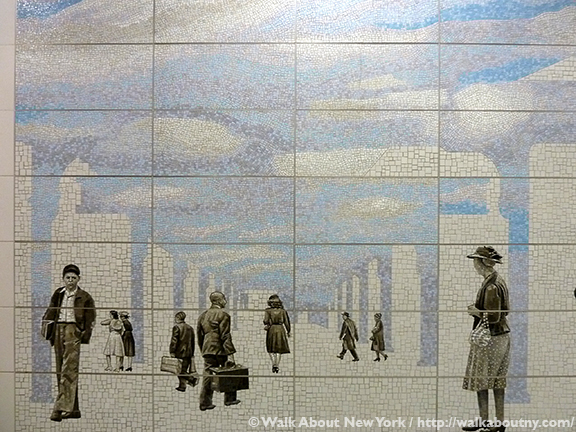 See this and other works of art when you take our eye-opening Second Avenue Subway Art Tour. Read last year’s article, International Women’s Day 2017; it will introduce you to more remarkable women who are included on other Tours you can be a part of. Take the Tour; Know More!